What Tidal Energy is and its History. tidal energy is a from of energy that comes from underwater. 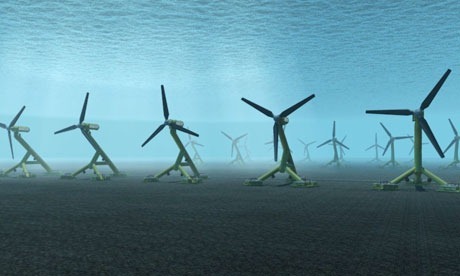 people around the world use tidal energy every day and power many different energy sources. Tidal power can be harnessed using a barrage (dam) built across an estuary that captures the potential energy generated by the change in height (or head) between high and low tides. As the tide goes in and out, the water flows through tunnels in the dam. The ebb and flow are used to either turn a water turbine or compress air through a pipe that then turns a turbine, which generates electricity. The tides will continue to flow, thus there will always be power being generated. the water isnt used up, it stays in the water cycle, and can there for be used over and over again without the need for replacement.